The Large White Butterfly is found throughout most of the British Isles, Europe and in large areas of the sub tropical world. It is often referred to as the Cabbage White because its caterpillars feed on crucifers, members of the Brassicae family of vegetables, and can be a pest to both commercial farmers and garden vegetable growers. For vegetable growers concerned about damage to vegetables information on effective organic preventative measures can be seen below. The adult Cabbage White Butterfly is the largest of three white butterflies commonly found in the British Isles. 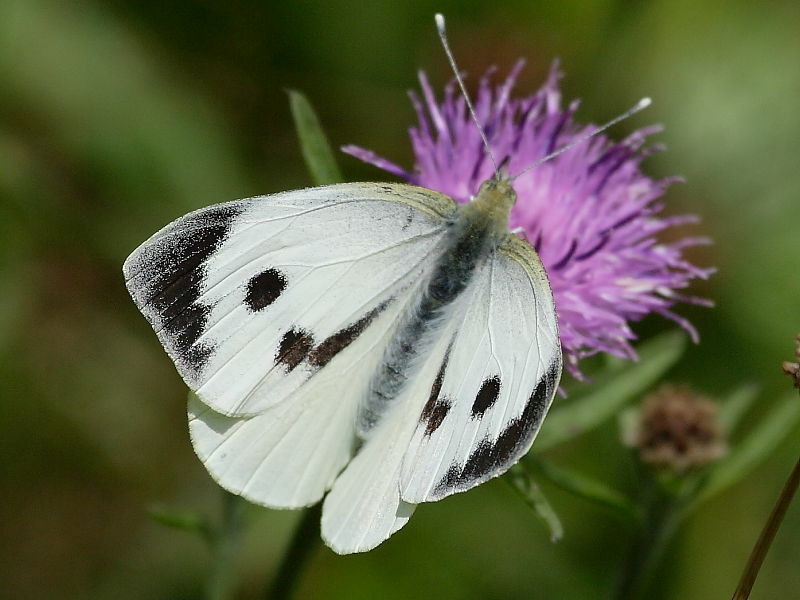 It is most easily identified from other common white butterflies – The Small White, Green-veined White and female Orange-tip Butterfly by its larger size, having a wingspan of up to 55mm and the extensive black tips to its forewings. The female Large White butterfly has two large black spots on both sides of each forewing which are absent from the upper surface of the males. 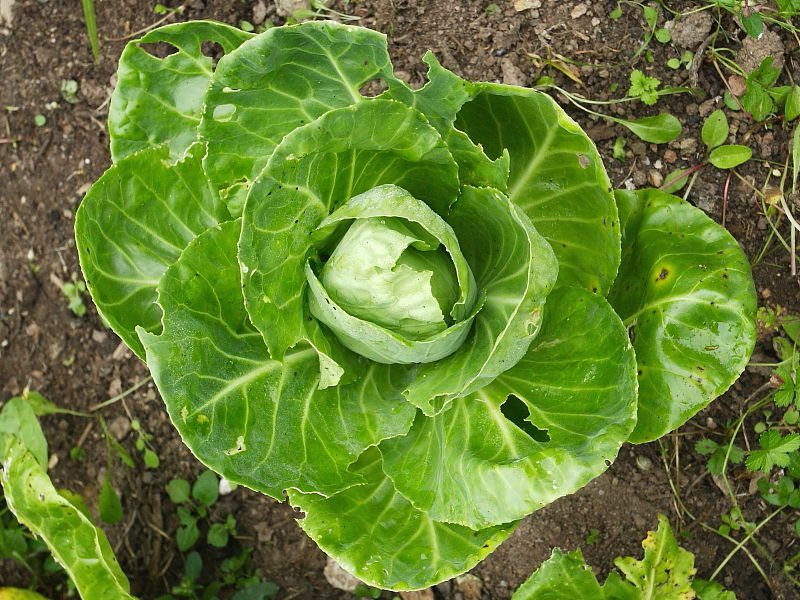 Caterpillar food plants include all crucifer plants found in the wild and cultivated varieties such as cabbages, broccoli and brussels sprouts. 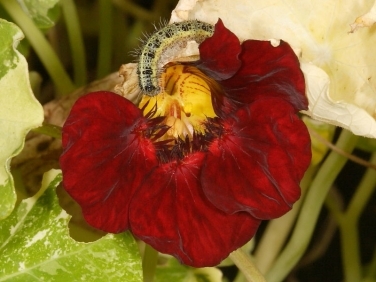 The butterflies are also attracted to the brightly coloured garden nasturtiums which some vegetable growers plant as a companion plant in an effort to attract the butterflies away from their brassica crops. In the British Isles it is double brooded with the female laying eggs anytime between March and October. Most eggs are laid during July and August when the numbers of resident butterflies may be increased significantly by migrants arriving from Europe. This also happens to coincide with maturing brassica crops. 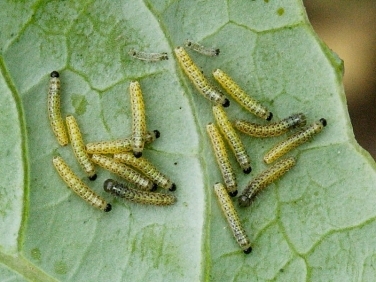 Eggs are laid by the female during the day in clusters of as many as a hundred, mainly on the underside of Brassica leaves. The egg clusters are yellow and can easily be seen against the green leaves. 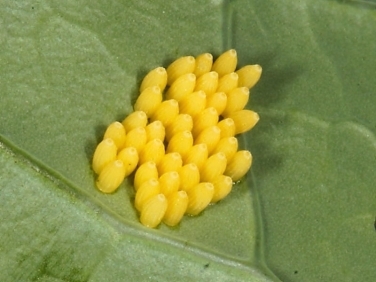 The eggs hatch within 14 days. Large White caterpillars grow up to 45mm and are a distinctive mix of black, grey and yellow. 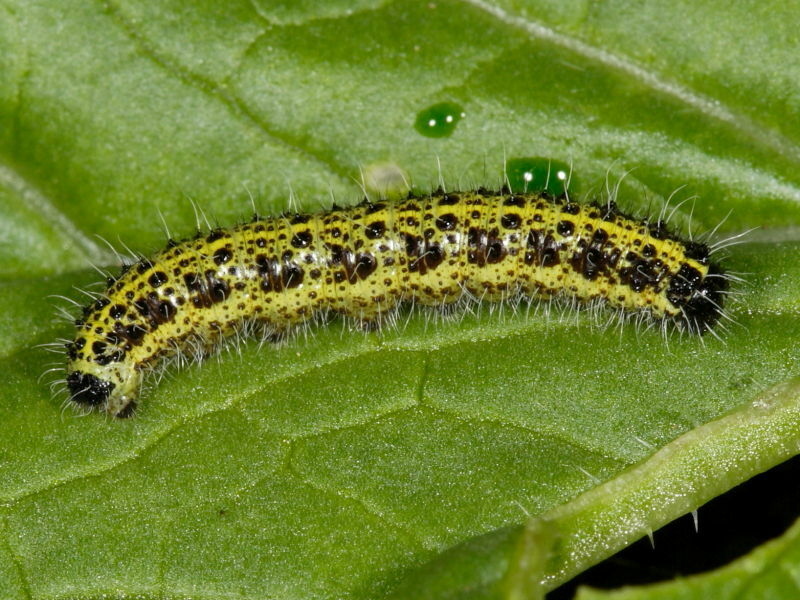 The caterpillars extract mustard oil from their food plants which make them unpalatable to birds. They give off a mustardy smell which combined with their bold colouring acts as a warning to predators. 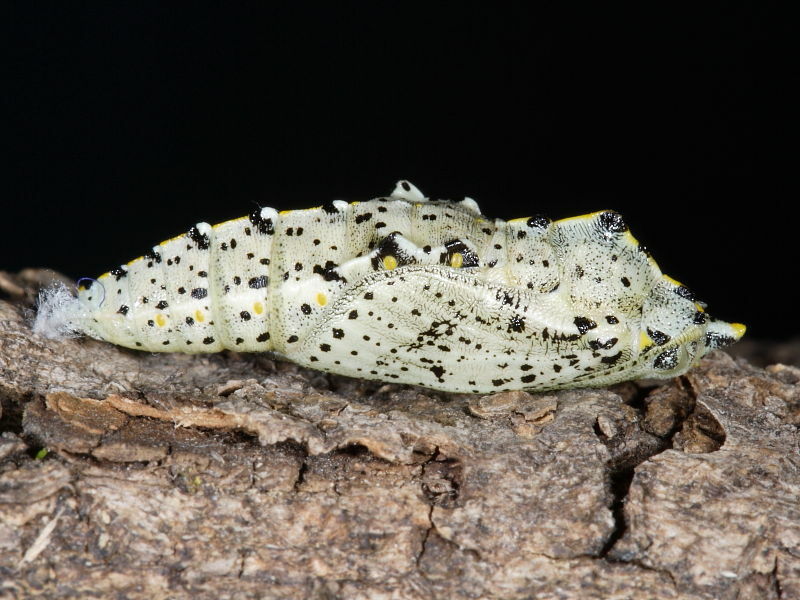 When recently emerged from their eggs they can be identified by their yellowish colour. They grow rapidly, shedding their skins four times and becoming generally darker with fewer yellow markings. The caterpillars are heavily parasitised by the tiny Ichneumon Wasp, Apanteles glomeratus. When fully grown after about four weeks the caterpillars stop feeding and leave the food plant to look for a suitable place to pupate. 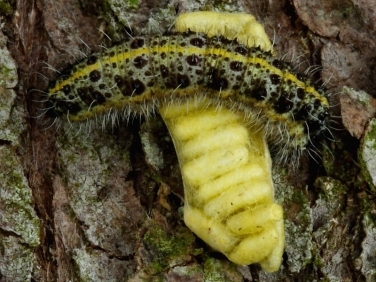 The chrysalises, which vary in colour according to their surroundings, are often secured by their silk pads and girdles to tree trunks and the walls of sheds. Butterflies from early broods will emerge in about 14 days but later broods will over winter as a chrysalis, emerging in March or April. However, many butterflies do not emerge having been parasitised. Vegetable gardeners will know only too well of the feeding signs of the cabbage White caterpillars. 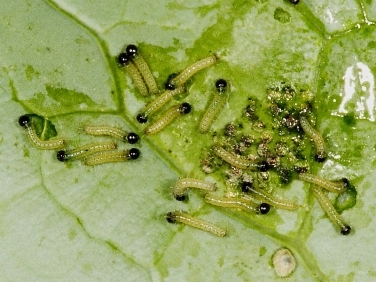 Slight fenestration of the leaves will appear soon after the caterpillars first emerge which is shortly followed by small holes as the caterpillars grow rapidly. Within two weeks large areas of leaves will be reduced to veins and by the time the caterpillars are fully grown whole plants can be stripped of all leaves leaving just the stalk. 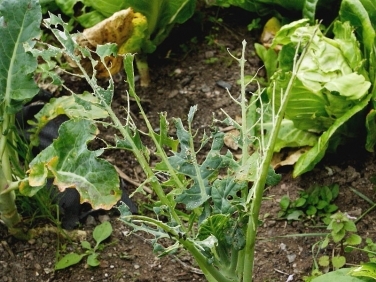 Although the Cabbage White caterpillars can do extensive damage there are simple organic and environmentally friendly ways to prevent it. The most reliable and least labour intensive preventative measure is to stop the female butterfly from laying her eggs on the vegetables. This can be done by suspending one inch mesh netting over the bed. 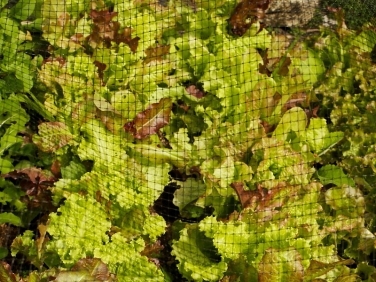 Care must be taken to ensure that as the cabbages grow they do not reach the height of the netting and enable the Cabbage White to reach the vegetables through the mesh with her extended oviposter and lay her eggs. 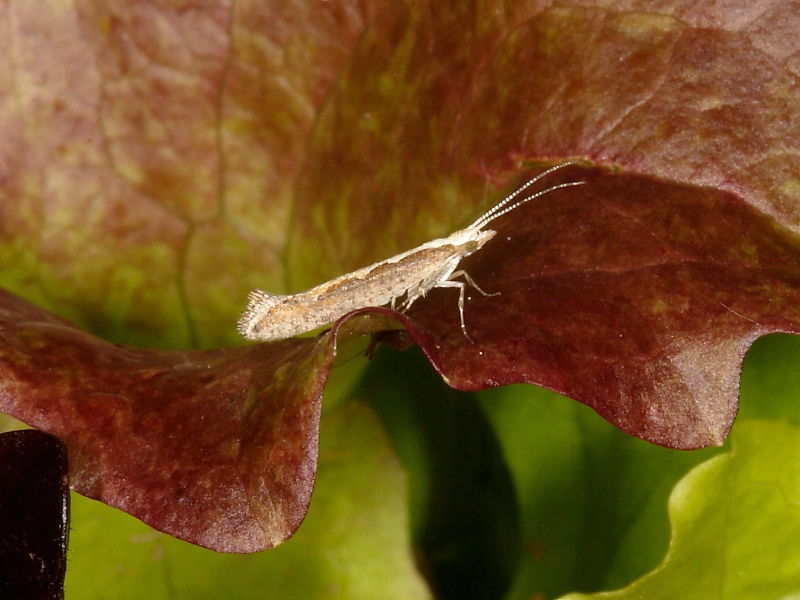 Although netting off is highly effective against Cabbage White Butterflies smaller insect pests such as the Diamond-back Moth (shown), The Cabbage Moth, Silver Y Moth and many species of fly and Sawflies will not be prevented from laying eggs on the vegetables. 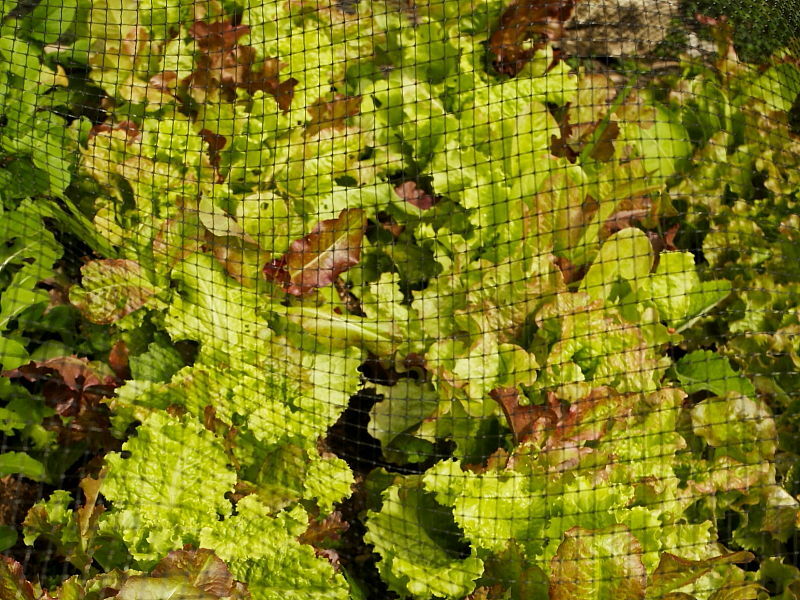 If the brassicas have not been netted then regular inspections of the leaves are required. The yellow clusters of eggs are easy to see on the underside of the leaves and can be easily scrapped off. Clusters of recently hatched caterpillars are also not difficult to find and can be spooned off. Larger caterpillars can be picked off wearing gloves and are easily located by damaged leaves and frass. Does companion planting prevent work? Much has been written about the merits of companion planting with Nasturtiums close to Brassicas in order to encourage the Cabbage White Butterfly to lay eggs on this colourful plant instead of on the vegetable crop. 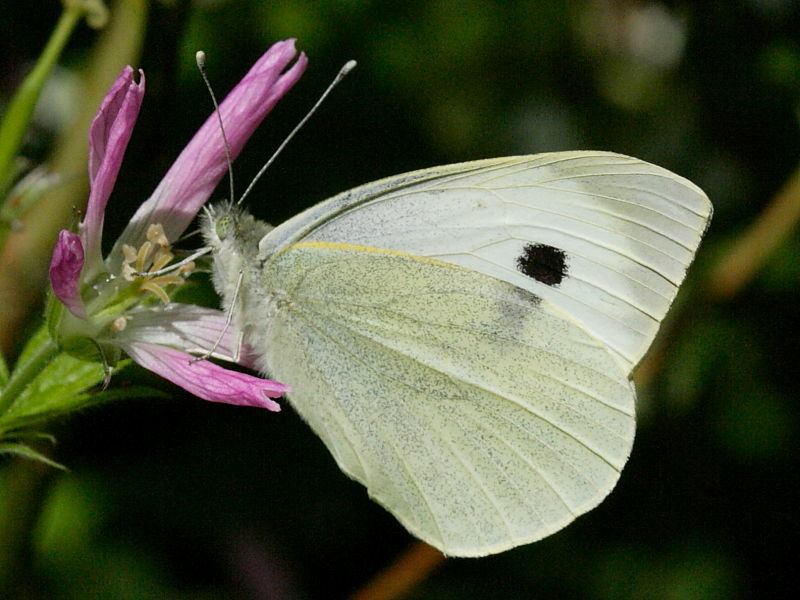 However, although the female Cabbage White has been shown at times to favour laying her eggs on these brightly flowering plants she does not seem to do this exclusively. It also seems likely that having Nasturtiums in the garden will attract more butterflies from neighbouring gardens and allotments. There are a range of pesticides on the market but care must be taken on selecting and using them. It is very easy to upset the natural balance of nature by using chemical pesticides that kill all insects. The parasitic wasp Apanteles glomeratus kill a high proportion of Large White Butterfly caterpillars and there are many beneficial insects such as ladybirds that help control Aphids, Mites and other caterpillar vegetable pests.